In 2002, when our Center building opened as the Southside Senior Activity Center, Nancy Tomlinson and Dude Thompson thought it would be a good idea to form an auxiliary group. “We wanted to make people feel welcome at the Center and to help in any way to could,” recalls Nancy. A year later, they got an okay from the board and 35 ladies became the first Friends of SSAC. “We greeted people, gave tours, hosted a lunch program, and were busy every day of the week,” says Nancy. But the name of the group just didn't work well. “Everyone thought we were Friends of Sacajawea,” recalls Jessie Quincy, one of the original members. 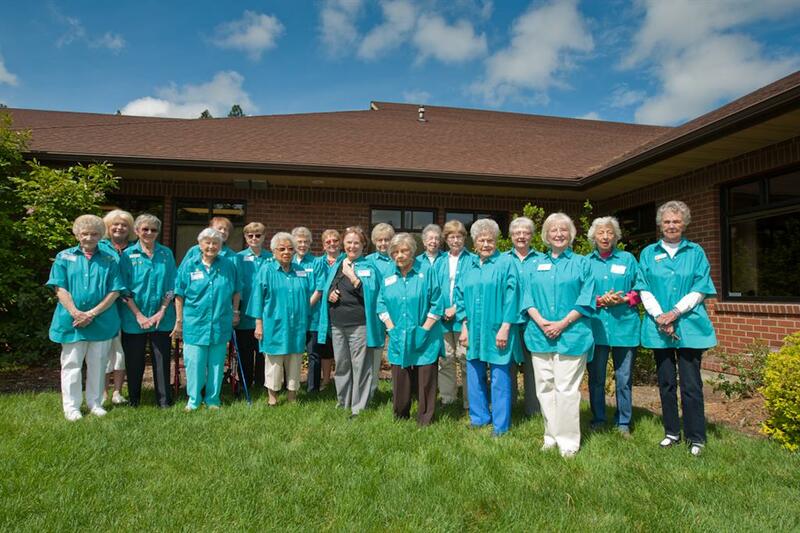 The ladies had bought smocks in a fashionable teal color as identifying uniforms. Teal was the color used on the Center's letterhead and in the newsletter. It was suggested that the group be known as the Teal Ladies, and the name stuck. Today, the Teal Ladies remain as busy and vital to the Center as ever. They are greeters at Center events and sell 50/50 raffle tickets. Member Betty Cosand organizes and manages the Classy Corner, the Center's thrifty, little gift store. They hold a bake sale as part of each Center garage sale. They are always buying items for the kitchen, and often replenish dishes and glassware that gets broken and silverware that gets lost. The groups committees also provide special service to the Center and community. The Sunshine Committee send notecards to members in need of a cheery greeting. The Library Committee oversees and updates the books to lend in the lounge. The Philanthropy Committee identifies four opportunities each year for giving. This year, the Teal Ladies are and will be making donations to the Human Society and Toys for Tots, and gathering socks to give to Crosswalk and back-to-school supplies for kids at Lincoln Heights Elementary School. It all adds up to quite an accomplishment, especially since they operate off of $1 a month dues, fundrasing efforts and donations. But both Nancy and Jessie agree they've enjoyed socializing and making new friends, while doing the Center and community a service. The Teal Ladies are in need of new members to keep their tradition of helping the Center flourishing. If you are interested, you can pick up an application form at the front desk. The Teal Ladies meet the first Thursday of the month at 10 a.m. in the Washington Trust Room. The Teal Ladies are already planning their annual Toys for Tots and Tree of Sharing drives. Giving back to the community is one of their major missions. To be part of this group of community-minded women join them on the first Thursday of every month at 10 a.m. The meeting this month is October 4. The Teal Ladies would love you to join them.